Etape du Tour 2018 profile. The 2018 Etape du Tour is a 169km ride from Annecy to Le Grand-Bornand, taking in four significant climbs and totalling an estimated 4,756 metres of ascending during the day (Sunday 8 July). Tour de France director Christian Prudhomme said that the stage will "undoubtedly be one of the highlights of the Tour de France" so it should be a fun but challenging day on the bike. I am not sure where they will start the Etape from but my guess is that it will be in or around the Annecy's Parc Charles Bosson. The good thing about starting in a city the size of Annecy (population 50,000) is that there isn't just one road in and out of town, so there shouldn't need to be too much panic about getting there at 4am before they block off lots of roads. The day starts with a 40km run from Annecy with a very gentle ascent of 146 metres over that distance. There are a couple of small bumps along the way but in a group you should be pulled along nicely and I'd expect this run to be done at a very fast pace, possibly too fast for many Etape riders who may well get carried away in the exuberance of riding in huge groups and burn a couple too many candles early on. The first 25km or so you will be riding south along the beautiful shores of Lake Annecy, down to the village of Talloires (famous for being a retreat for artists and writers and now a big tourist centre), before heading slightly east again and then north towards Thônes, a picturesque commune which is best known for being the home of reblochon cheese, a soft washed cow's cheese which is the key ingredient in tartiflette, one of the most tasty specialities of the Savoyard region. The climbing starts at Thônes and is a 876 metre climb over 14km to the top of the Col de la Croix Fry (not to be confused with the more famous Col de la Croix de Fer which is about 100km away), meaning it is an average slope of 6.2%. However that disguises that it really can be divided into two, a first section up through suburban gardens, chalets and farms to the village of Manigod which is relatively gentle (the last kilometre into the village averages just over 3%), followed by a kilometre out of the village at 8%, two kilometres at 9% and then the last 3km at an average of 8%. At the summit is a cafe and I'd guess they may also try and put a feed station up there. This climb has been used in the Tour de France four times, most recently in 2013. There then follows the descent into the ski village of La Clusaz, which is a 8km descent at an average of 5.3%. It's a relatively easy descent apart from one large hairpin about 2.5km from the summit which may catch out a few people who get too excited about the first descent of the day. La Clusaz was one of the first ever ski resorts, opening in 1902, and is picture postcard pretty. It is usually visit by the Tour de France before the ascent of the Cat 2 Col des Aravis. However that's not part of today's route. From La Clusaz the route heads north to Saint Jean de Sixt and then north along the D12 to Entremont, where you hit the 70km mark. This road is a gentle downhill all the way and should be pretty pacey, especially if you get in a decent group. Out of Entremont there is about six of kilometres downhill and then you start climbing. Turning left off the main road onto the Route des Glieres, you start the ascent to the Plateau des Glieres, which up until now has always been described as one of the greatest climbs in France never used by the Tour de France. I don't want to get you worried but the reason it hasn't been used is that parts of the road are gravel. And it's really steep. The first couple of kilometres are a mere 8% average but then the next 6km are hard. The average gradient for those last 6km are 11%, but as Prudhomme said in his presentation of the Tour route: "Per kilometre, the average does not go below 10%, which is very rare". The road is also pretty narrow. If you are in one of the later starting pens then you may well find that the road is fairly congested, especially as I'd expect some people to be walking. Once you get to the Plateau, there should be a couple of kilometres along rough gravel tracks (there will probably be a food station here too) and you can remember the history of the plateau. During World War II it was a centre of the Resistance and it is where British planes would drop supplies to aid the Resistance because it was so isolated. In March 1944 it was the site of a huge battle between the Resistance and 5,000 Nazi troops which saw 121 Resistance fighters killed. The gravel sections should not be too much of an issue, unless it is wet. If it rains it will make it far more likely for riders to get punctures and I can see a lot of the 10,000 odd Etape riders having to be pretty careful along this section. I can see how the Tour organisers could make this work for 180 pro riders (or however many make it this far) but it does seem a little ballsy to ask that many amateurs to ride a lengthy unpaved section, albeit that it's pretty flat along there. There is then a 723 metre descent over 15km (so an average of 4.8%), which is a smallish road so you will need to be careful. But by now the field should have thinned out quite a lot so it shouldn't be too hairy a descent. The descent ends in Thorens Glieres, a small village best known for its castle. The road then heads north east to Bonneville, a 25km run which starts with roughly 5km of climbing at an average of 5.5%, followed by a gentle descent of 20km at roughly 4% which should be a lot of fun and pretty speedy. This is actually a decent length of time to recover and to make sure you feed and hydrate properly. Bonneville is 120km into the ride and if it is a hot day then Etape newbies may well be feeling the effects by now. Bonneville is what I think it politely called an 'urban centre' which means it lacks beauty and is rather industrial. This will not be the prettiest part of your ride. There is then a really flat 12km drag along the valley to Scionzier, the last chance to get some energy before a 25km uphill section. From Scionzier there is a roughly 13km ride up the Col de Romme, which although it is officially at an average of 5.3% the stats don't really show how tough it is. After 2km there is a 4km section at an average of 7.5%, followed by 3km at 3.5%, then 4km at 8%. There are 10 hairpin bends. In the heat of the middle of the day and with 120km in your legs, you will know about this climb. I've never ridden this climb but people who have describe it as "unforgiving" and "one of the toughest in the region". Off the top of the Romme there is a 5.5km descent in which you lose 232 metres of height (4.2% average) but all that is going to prove is the old cycling adage that "what goes down, must go up" (that's right, isn't it?). You arrive in Le Reposoir, a hamlet, and now the real fun starts with the ascent of the Col de la Colombière. The good news is that it is a short climb of just 7km. And it's the last climb of the day. The downside is that it a little steep. 633 metres of climbing at an average of 9%. And it is relentless. It starts with a few hairpins and then you climb up the north west slopes before 4km from the top of the climb it opens up and you can see the summit high above you. The landscape is rocky and a bit like a moonscape, although if you have the energy to admire the view then you are a strong rider. The final kilometre is at 10.2% and you should have a real feeling of achievement when you reach the top. This will be the 21st time the Tour has come to the Col de la Colombière, giving some sense of how iconic a climb it is, although the most recent time it was here was in 2010. If you've made it this far then you know you will finish, unless your bike has a catastrophic failure. It is, as they say, downhill all the way. The 12km descent to Le Grand-Bornand should be some of the most pleasurable riding of your life, if only for the sense of elation at finishing. It is 675 metre of descending at 5.6% and apart from the steep first kilometre is a nice descent, albeit with quite a few hairpins. You want to keep up your concentration, given how long you've been riding for. 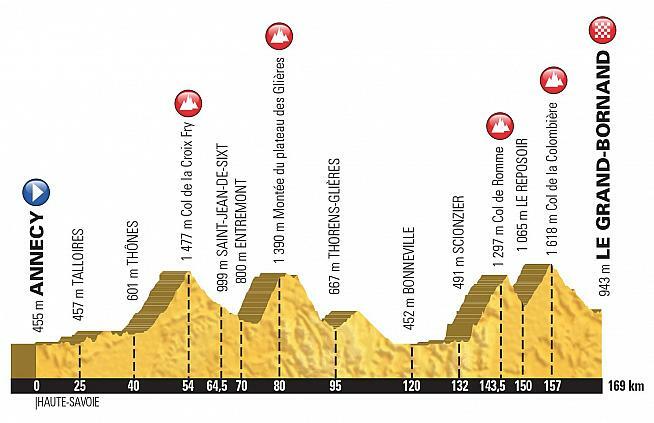 Having written Etape route previews for the past five years, I'd say this was a pretty tough one. There is a really decent amount of climbing and there are quite a lot of sharp, steep climbs which will be really energy sapping. As with so many of these rides, the temperature on the day will really help shape how hard it is. With so much of the serious climbing in the later stages of the Etape, if it is 35 degrees at noon then it will be a proper test for anyone without a decent amount of Alpine climbing experience. It looks a lot of fun though and anyone who completes it should be pretty happy with their riding. I've put together a Strava of the 2018 Etape du Tour which should be pretty accurate but may not get all the roads totally right (there may be some diversions along smaller roads but I doubt the organisers have actually decided that by now).